This Linear B Tablet PY 641 is by far the most difficult one I have had to translate. It was the first ever Linear B tablet which Michael Ventris deciphered in 1952. I was in my teen years then and knew nothing of his great achievement and in fact nothing about the Linear B Ancient script writings whatsoever. I am aware that many scholars have translated this tablet such as the archaeologist Carl Blegen, and also Prof. John Chadwick, who assigned the first range of standard values to ideograms for the vessels on Linear B Tablet 641. Ref: Chadwick, John. The Decipherment of Linear B (2nd edition) London: Cambridge University Press 1970. ISBN 521-09596. pg. 117. 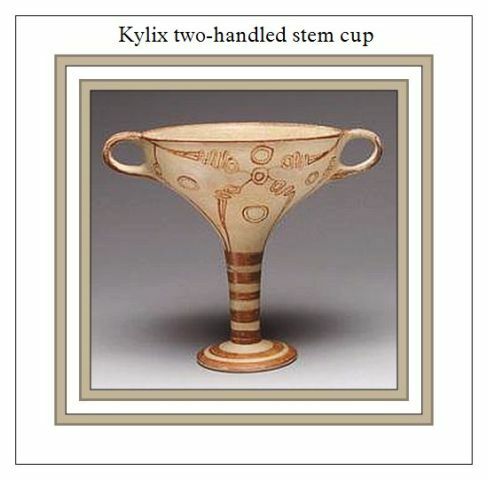 1 Small type of cup/goblet without handles. As an archaeologist working on Minoan pottery for the past ten years, I feel that adding a few descriptions of the pottery vessels mentioned on this Linear B tablet will further our understanding of their important shapes and uses. Also, we must remember that due to the lack of sufficient room on these very small clay tablets, the Minoan scribe recording so many items would not have been able to write all the details for us to read in our modern times. 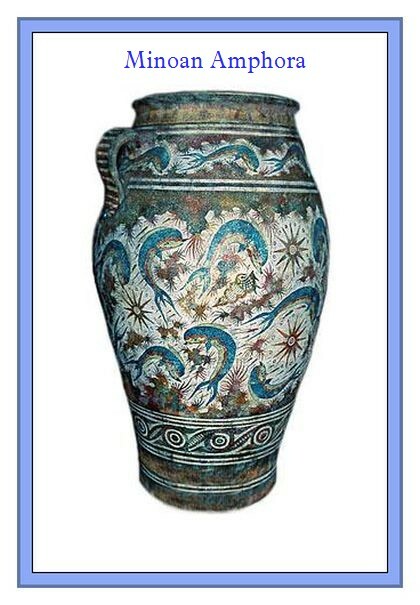 But of course, his fellow Minoan scribes understood exactly what the pottery items were. The following is my idea of what I believe the Minoan scribe has listed on this Linear B tablet PY 64l and what they were used for. 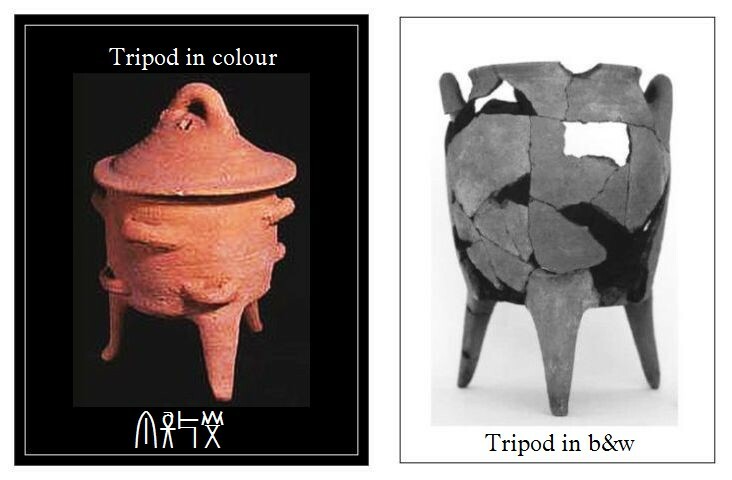 Pithoi - Because the Linear B word mezoe means ‘greater/bigger’, I interpret these pots which have three and those with four handles as being Pithoi. 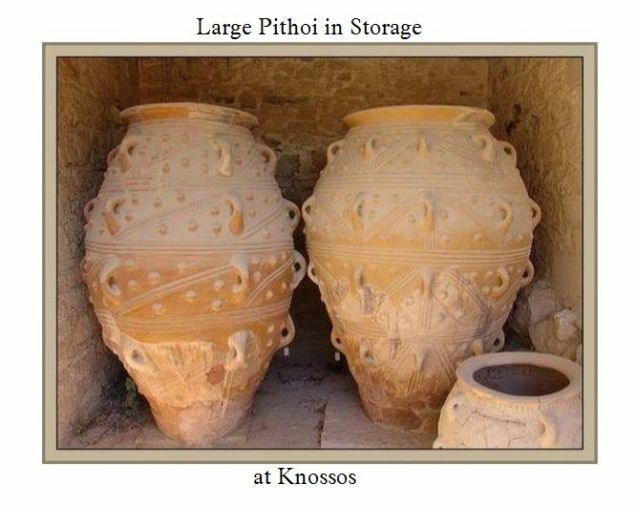 They were used for the storage of large quantities of agricultural produce such as grain crops, olive oil and wine. These huge pots could have as many as eight handles. Amphorae – (singular, amphora) These pots having two handles or even three handles were used for the storage and transport of oil or any other liquid substances. Amphora – mewijo means smaller. The other amphora listed on this tablet with four handles was most likely used for the storage of perfume. After further research into archaeological reports and illustrations at The Institute for Aegean Prehistory Study Centre for East Crete and The History of Minoan Pottery by Philip Betancourt 1985 Princeton University Press, Princeton, New Jersey, I found that the two cups listed on this tablet PY 64l can only mean a (type of cup). 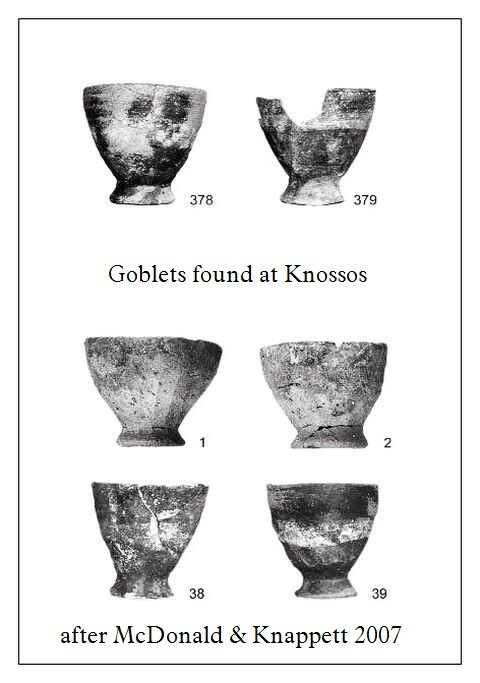 I therefore interpret them as being goblets, although the one with three handles possibly being a kylix Both were drinking vessels. 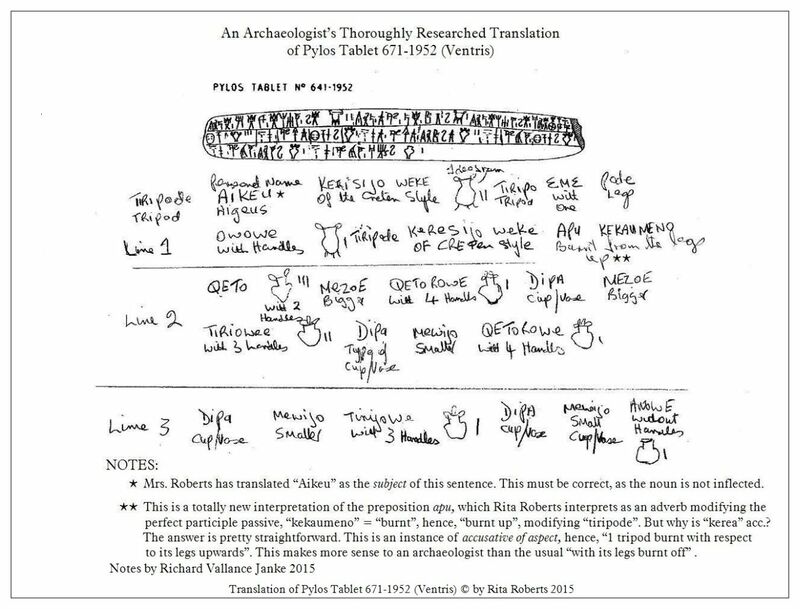 Congratulations to Rita Roberts for her excellent translation of Pylos Tablet 641-1952 (Ventris), which she has grounded on her thorough research as an archaeologist into every last type of vessel illustrated by Prof. John Chadwick’s classification of ideograms for vessels. What is particularly impressive here is her insistence on checking one by one all of the ideograms (which are after all symbolic representations of the real thing) against prominent archaeological finds of each type. This very effective approach is novel, in so far as all of translators to date of tablet Pylos 641-1952 (Ventris), whether or not they were archaeologists themselves, have never taken the trouble to cross-correlate the various ideograms with their actual hardware counterparts. By taking this critical step in gathering concrete evidence to back up her choices for the name of each and every type of vessel on this extremely significant tablet, Mrs. Roberts has provided us empirical evidence as confirmation of the types of vessels named and flagged by ideograms on the tablet. Why no one has done this in the past is beyond me... and beyond Mrs. Roberts as well. At any rate, it was this technically challenging tablet which I assigned to Rita Roberts as the final step in her Secondary School Level studies. I am delighted to announce that Mrs. Roberts has achieved a mark of 98% for the extreme thoroughness of her research, especially in the archaeological sphere. Rita is thus granted her Secondary School Matriculation with all its attendant rights and privileges. I shall be designing a Secondary School Graduation Certificate on fine linen 25% cotton paper, beautifully framed, to send to Rita Roberts. I shall also post her Certificate right here on our blog for all to see. It goes without saying that I myself shall not attempt to translate this famous tablet, because to be perfectly honest, I could not have come up with a translation as thoroughly researched or as minutely detailed and accurate as this one by Rita Roberts. Mrs. Roberts is now at the first year level of university studies, and as such, she is now confronted with even greater challenges, being obliged as she is to translate tablets (much) more complex than Pylos 641-1952 (Ventris), to master all of the logograms and ideograms in Mycenaean Linear B, and to thoroughly learn all of the vocabulary in the military sphere from the comprehensive English – Mycenaean Linear B – Archaic Greek – Modern Greek Lexicon of Military Affairs she and I are to publish by June 2015. 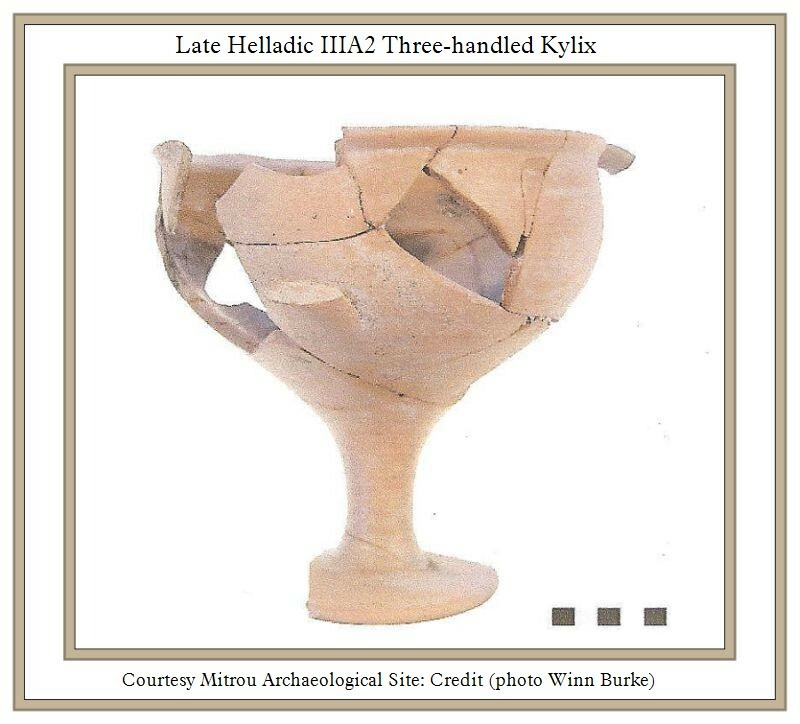 In effect, her studies for the first two semesters of her first year will focus primarily on the translation and the mastery of Mycenaean Linear B tablets on military affairs. She is also hereby granted the status of co-moderator of this blog. The pictures are very useful. I would tend to go with Rita’s translation of apu. This is a variant of apo and can be a prefix of kaio (καίω) making αποκαίω or burn away. These prefixes which in later Greek were firmly attached to the verb seem to have been more detached in earlier Greek and more like adverbs than prefixes. I’ve looked at this again and realise I was misreading it. It was Rita who translated apu as “up”. I don’t think it can have this meaning in Greek. By the way in your transcription you haven’t included the word “kerea” or legs. This had me somewhat confused when reading the note. I am enjoying your blog especially your enthusiasm for the subject (not many people could make lists of quantities of sheep or wheels or food items interesting) and for introducing me to Linear B.